Don’s Pretty Close to Southern Fried Chicken is almost as good as his Momma’s Southern Fried Chicken. You are gonna love it. Go on. 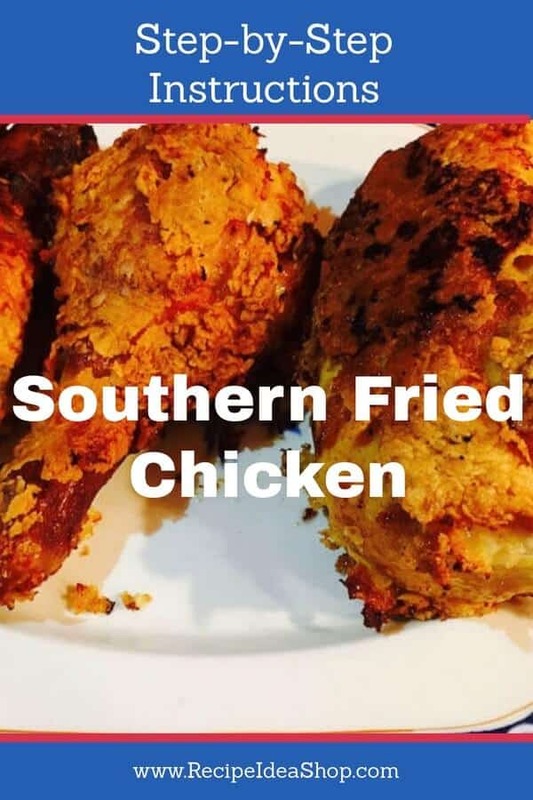 Make yourself some Southern Fried Chicken. It’s SO good. 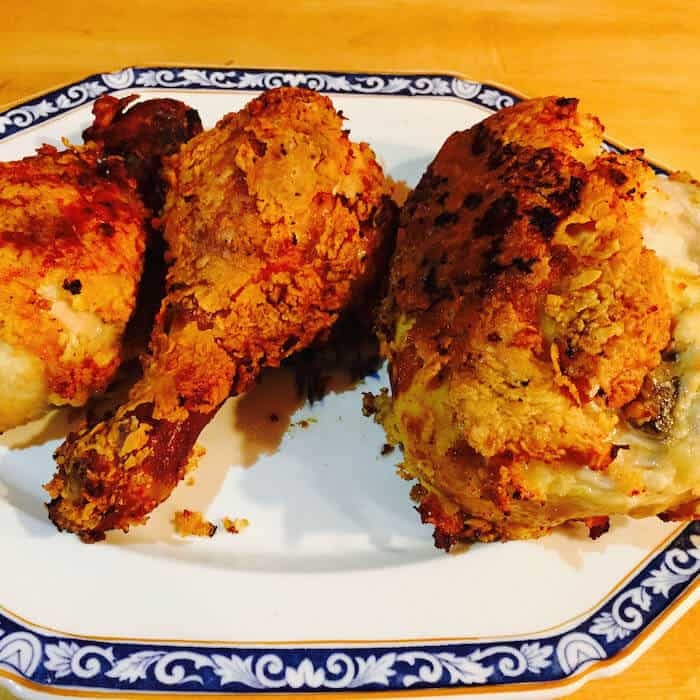 Don here, telling you about my Pretty Close to Southern Fried Chicken recipe. Maybe it’s legend or maybe it’s fact that throughout the South in days gone by folks came home from church on Sunday to sit down to a dinner of fried chicken, mashed potatoes, gravy, green beans, sliced tomatoes, biscuits and peach cobbler for dessert. Families and extended families gathered like the Reagans on Blue Bloods for fellowship and food. 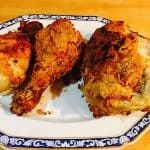 Sadly, those times are past in our family, but good home cooked fried chicken is still a treat for Sunday dinner or any other day when there is time to make it. My Momma Betty could make some terrific Southern Fried Chicken, and I grew up on it. If I don’t make it myself, I like to go to The Southern Inn in Lexington, Virginia, for some terrific Southern Fried Chicken. This recipe makes three large pieces or six small ones. Enough for six people. Serve with Mashed Potatoes, Cooked All Day Green Beans, and Coleslaw. Trust me, you’re gonna wanna eat this chicken. Make your cooking easy with a FryDaddy. Presto 05420 FryDaddy Electric Deep Fryer. Buy it on Amazon. Place them in a bowl large enough to hold them and cover them with buttermilk. Cover and allow the chicken to soak in the buttermilk in the refrigerator for at least one hour or overnight. In a brown paper bag large enough to hold one piece of chicken at a time, add the flour and spices. Shake to blend them. Heat the oil over medium-high heat in a cast iron skillet until a drop of water dances on the surface. Take one piece of chicken at a time from the bowl of buttermilk and place it in the paper bag. Shake the chicken in the bag to coat it with the flour mixture; then add it to the skillet. When all the chicken pieces have been frying for about 10 minutes, turn them over to brown the other side. Cover the skillet and reduce the heat to allow the chicken to fry for 10 to 12 minutes. Uncover the skillet and let the chicken fry for another 10 to 12 minutes. Turn the chicken once again to brown the other side. The chicken is done when a thermometer inserted into the thickest part reads 185F. If the chicken is getting too brown but is not yet done, which can happen with large pieces, place the pieces on a rack in a baking pan in the oven to continue cooking. Don’s Pretty Close Southern Fried Chicken. Each serving is about 3-4 ounces (1 thigh, 1 drumstick, 1/2 a chicken breast).